Full Colour Laminiated. Includes 120 Terms. How many times have you whiffed a glass of wine and thought "I know that smell", but you just couldn't put your finger on what it was? The Wine Aroma Dictionary has been specifically designed to help you beat that 'tip of the nose' frustration! 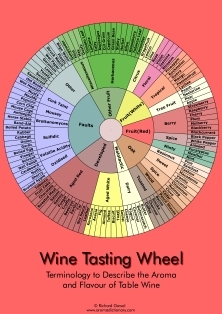 The Wine Aroma Dictionary is a comprehensive list of descriptors that you can use to describe both red and white wines. Logically presented and in plain English, it is suited for everyone with an interest in wine.